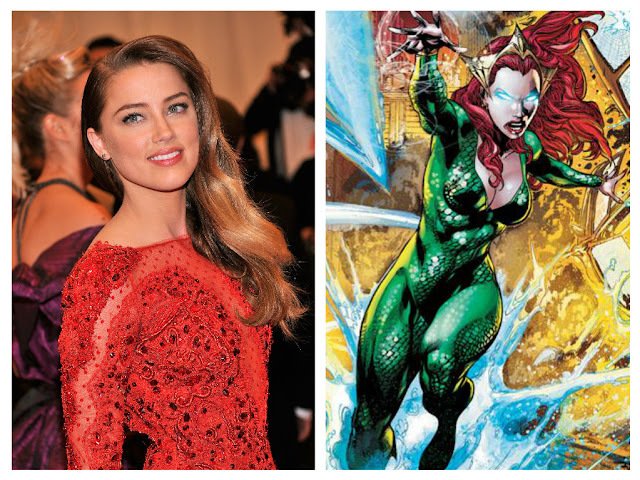 It turns out that the previously rumored report of Amber Heard (The Danish Girl) being considered for Mera in the DC Comics' adaptation of 'Aquaman' has become a reality. During an interview with ET, Heard confirmed she's been cast in 'Justice League' and 'Aquaman' as the undersea queen. She'll make her first appearance in 'Justice League Part One' in 2017 directed by 'Batman V Superman: Dawn of Justice' director Zack Snyder. In 2018, she'll reprise the role opposite Jason Momoa for the 'Aquaman' solo film directed by James Wan (Furious 7). The costume design for the fierce Queen of Atlantis and wife of Aquaman has already begun as she told ET. "It's interesting. It's like, half suit of armor, half scales," Heard revealed. "It's strange... We're in the process of building it now, so it's coming along." In the comics, Queen Mera is exiled from her kingdom in another dimension. She gets help to reclaim her throne from Aquaman and soon fall in love and decides to remain with him on earth in Atlantis. Mera has the unique ability to form "hard water" objects, as well as super strength and powers related to her adaptation to live under water. She has been shown to be powerful enough to control, albeit briefly, huge amounts of water, enough to pull an entire army out to sea.